It pours cloudy with red and no head; this either means glory or my bad homebrew. Luckily I grabbed the right bottle and glory hits the tastebuds. The nose was all pale malts, yeast, alcohol and sour cherries. The persistent alcohol warmth blends wells well with the medium effervescent mouthfeel. There is light fruit esters (apricots), but the big winner is the sour cherries. Their dominance is subtle and lasts from start to finish. The alcohol warmth and sour cherries had a kirsch-like quality. You could not taste it, only feel it. I think this one will do well with aging. The first stock wave vanished from Victoria within hours. The new map for L4D is short but sweet. The Passing was great; I missed Francis. I hate pessimistic guys with tattoos. Everything Driftwood touches turn to gold. Their output may not be voluminous, but the quality is sure there. Take a good, strong Belgian Ale and add sour cherries; not the syrupy kind. This is the Driftwood Belle Royal: well done. This is a standard IPA with a sweet citrus and pine hop nose with caramel malts. The taste is pretty standard also with caramel/biscuit malts and a mild chaser of citrus/pine hops. Oddly the hops did not bite; it was a creamy and dry mouthfeel . This beer won the bronze medal at the 2010 World Beer Cup in the English IPA category. It was dry and clean with just a hint of citrus. Just as an IPA should be. I thought this was an ordinarily mild IPA. I thought it was a little malty for an IPA made on the West Coast. It is a good thing I'm not a World Beer Cup judge. Hopheads would not approve. I take back all the bad things said about Phillips beers; this beer is uber-delicious. For the love of cascades, this brew is about as balanced as CNN. The nose was shocking with the sweet cascades; pine, grapefruit citrus and cotton candy. It is also a pleasure to look at with its clear and golden/amber hues. Malts are hard to find but you can barely make out the grassy and pale straw. The hop circle is all about the hops. Normally the Phillips IPA are a little bit astringent and mouth puckering; not this one. They are glorious, sweet with grapefruits, pine and cotton candy. Ever sip is pleasant and not overpowering. Imagine Red Racer IPA but more cascades. It was long lasting, but subtle amounts of pine and grapefruit remained. The burps brought the grapefruits back with a vengeance. As a good IPA should be. I plan to go out and buy another six pack. This is something I rarely do. My father and I enjoyed this beer in the backyard after a hard day of gardening. It was a Norman Rockwell moment. This IPA was perfect with the grassy/straw pale malts barely containing the smooth and creamy cascades. Phillips Hop Circle is now the current IPA champion of BC. I am getting to be quite the Southern Tier fan. All of their beers have been epic. Wow, the nose of sweet grapefruit mixed well with the slight roastiness. The mouthfeel was medium-full with a slight astringency and effervescence. Up front the hops hit you with a GLORIOUS sweet, ruby red grapefruit and slight pine. This was followed by a mild roasted chocolate from the dark malts. Take their unearthly and add chocolate malts. The slight astringency from the citrus hops teamed up with the faint chocolate to hang on and never let go. Oddly it was not that warming. 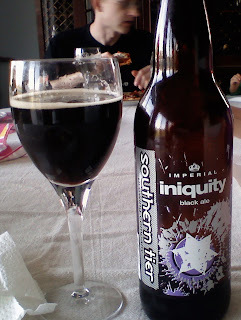 Had this beer at my buddy Meterman's (Geoff) house. After this beer, one session lager and 1/2 bottle imperial homebrew, all I was good for was video games. Even that was a challenge. Call it a black ale or call it a black IPA, just call me when you open one. I will be there. This was not a great beer. Its nose was ripe with caramel and vegetal. The high carbonation gave a very mineral taste. It was creamy with a medium mouthfeel, but more like a amber ale. I never really noticed a hop presence. After the creaminess left the hop bite was minimal at best. The hops were a little soapy. This was a very lackluster and uninspired beer. Very overpriced at $10 a 500ml can. I don't think I would pay $1 for this swill again. I had this beer in the Quebec house at the 2010 Olypmic Games. At least the floor show was excellent. I'm not sure if I got a bad can, or it got too warm, but this beer stank. For an IPA there was no hop bite and lame, tired malts. I would rate Alexander Keith's a better IPA than this. This is a speed review because I have too many backlogged beer notes. Get it while it is still on tap at Clive's Classic Lounge. They also have the Fruli Strawberry beer on tap. The nose was faintly vinous with plums, esters and light spice. This amber ale was medium-full bodied with good carbonation and a creamy mouthfeel. It was quite fruity with cherries, plums, grasses and a subdued spicy hop ending. The ending was quick and dry. I'm not sure how it would taste in a bottle, but on tap it was nice, flavourful and refreshing. De Koninck was a pretty good amber Belgian. It was fruity, creamy with a subdued spicy hop ending. It certainly smells like a standard West Coast IPA: citrus, pine trees, bready/caramel malts. The nose was pretty light though. The big hop tingle up front was more than expected. All my favourites were there; the grapefruit, citrus, pine and all slightly sweet. It was medium-full bodied and had English like biscuit/caramel malts. For those watching the stats it had 45 IBUs. It ended cleanly, which was odd for a very assertive hoppy brew. The citrus hop soup faded too quickly. I would recommend this to any hophead. It was a good value local IPA. Today I sent off a letter to the Ontario craft brewers association asking for free beer to sample. Wish me luck. I'm not sure if this counts as a positive score, but it does boost this beers rating. The Hoppelganger was a good West Coast IPA; lots of citrus and pine hops with biscuity malts. Sadly the nose was a little absent. A solid performer. It pours with a large, long pillowy tan head. The colour is as black as a coal mine at night. Oddly the nose is faint but carried some roast, chocolate and fruit scents. The mouthfeel was thick, molasses with a right amount of alcohol burn. The burn wastes no time and hits the lips at the start. Bitterness is delivered 1/2 from earthy hops and other 1/2 from roasted malts and bitter chocolate flavours. The bitterness barely contains this sweet and dry stout. Did I mention about the coffee, big roasted and chocolate bits? For those keeping stats it was 21 Plato and 65 IBU. It was not as long as I would have liked. The finish was just like the first sip with no new surprises. Eventually the dry, roasted finish just vanished clean. It did take a while. It is a session beer as long as the session lasts about 3 hours per one liter bottle. 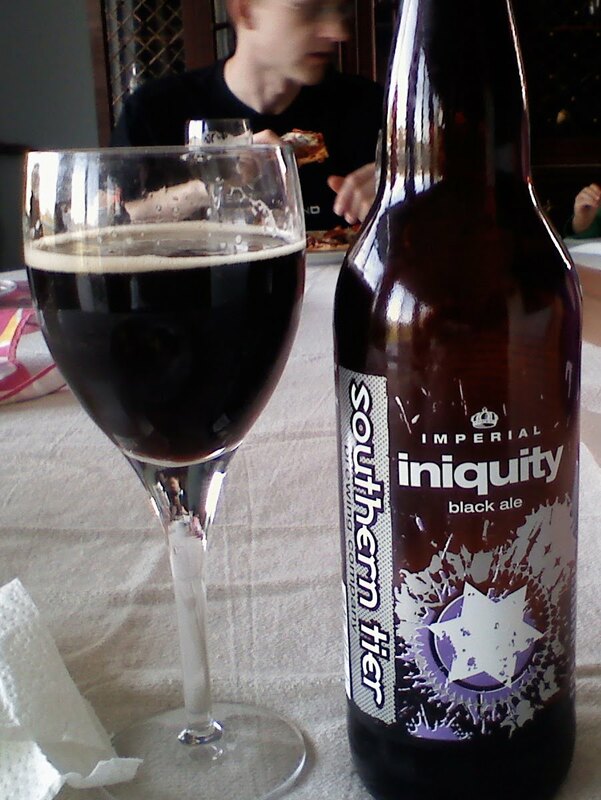 A wonderful, wonderful imperial stout. Buy one if you can find it. It really did a number on my reflexes. I was about as sharp as a wet paper bag. At least I had a good time whacking zombies, even if they were a bit blurry. Yay, the second perfect 10 of the year. This is a must for those who like big, roasty, chocolaty stouts. Make sure you share it with a friend.